Did you miss me? I know I’ve been gone a while. Where did I go, you ask? Well thanks to Google Maps, you can see my path to New Orleans for Mardi Gras. go down to New Orleans with me. my way to New Orleans. twice (hey, where u at? ), and arrived just in time for the Superbowl. We won’t talk about Philly losing. At all. Number of beads I got? 11. Do I have more pictures? Nope. Thank goodness. 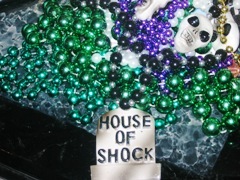 You wouldn’t want to see how I got the beads, would you? ( I plead the 5th). The drink of choice while in New Orleans? A hurricane. is enough to make the mack daddy in me come out. Again, I plead the fifth. a bar or stand outside, cavorting. Pound pound, sista, pound pound. them? On second thought, don’t answer that…..
concert….and I coudn’t even meet up with him on Saturday. Damn, damn, damn. worked, making up for my two days off. I have to really figure out whether out I’m going to SXSW. and not even 101 days have passed? Geeze. At least I completed another task. And, lest we not forget, today is Valentines Day. Happy Valentines Day to all. Much love. Whats with you and cars and electronics? You must have been some kind of electronic demolition man or something in a past life, LOL. About #5, you can just show/tell me and I will describe it for everybody…uhhh that didn’t work did it? LOL. Glad you had a great vacation…well almost great. That discussion we had on Saturday and your post above leads me to believe our Rodeos..belong in a rodeo…for real. Welcome back, bruh. LOL@Honey’s e-demolition man comment! At least you made it home in one piece – that was my concern. And it you decide to go to SXSW after our discussion yesterday, I will kill you. Okay, perhaps “kill” is too strong a word. LOL, I’m with Honey…what is it about you with cars and electronics? i don’t know about y’all, but i want to see how he got the beads. Hope you have a splendid Valentine’s Day!! Hey, i’m jealous. Sounds like a great time. Good on the vac time, bad on the car. At least it happened after the fun stuff. Happy Belated V-Day Papi. I’m sorry about your car. I missed Eric too :-/. Not due to car trouble though. I was too lazy to leave home. Yep. That’s all. A severe case of laziness was the cause of me missing the concert. $36 down the drain :(. Boo for me. Now I know why my car stopped working after you was in it. Thanks bro. sounds like you had a decent vacation so tell us Eric, how DID you get those beads, eh? lol!